Atomic symbols spell out every parent's favorite phenomenon: naptime. Bedtime battles, cranky campers, and full-blown meltdowns—parenting is far from an exact science. But the elemental certainty of the periodic table brings a playful touch to this nerdy babysuit. 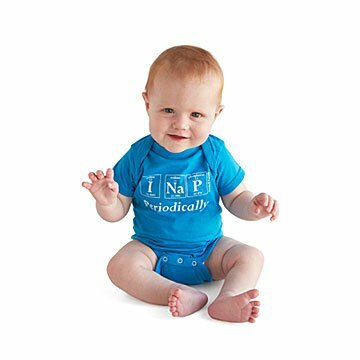 Atomic symbols for iodine, sodium, and phosphorus spell out every parent's favorite phenomenon: naptime. The 100% cotton coverall with three-snap bottom closure makes great gear for budding Einsteins and a geek-worthy baby shower gift. Garment made in India. Designed by Courtney Church and printed in Pawtucket, Rhode Island. Courtney Church worked in corporate e-commerce for 12 years before starting her own retail line. Her design skills are self-taught and inspired by the elements of the Periodic Table. When her son was born, she was able to leave the corporate world and transform her scientifically inspired work into a full-time business. She continues to gaze at the Periodic Table and imagine new words and phrases to keep science fun and promote awareness of its importance in our culture. Originally from Providence, Rhode Island, Courtney now lives and designs in the mill city of Pawtucket.